To my way of thinking, a neighborhood can rarely have too many bars. 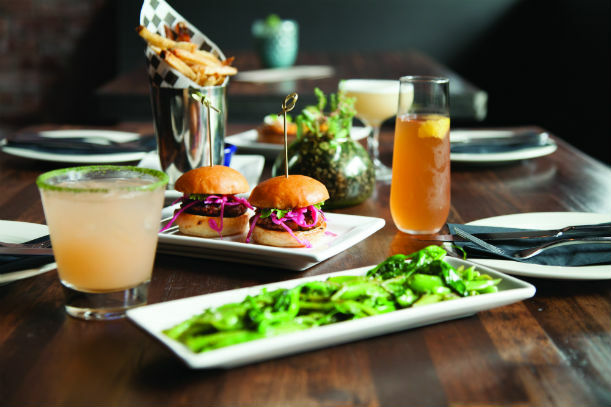 Even Belltown, home to a number of luminous lounges and more, can always happily fit another. Enter Wakefield (2318 Second Ave.; 206.770.7824; wakefieldbar.com), which delivers a comfortable vibe for downtown denizens looking to watch the game on one of the two big TVs, enjoy a moment of sunshine on the deck or catch up with friends while relaxing in a long booth or at the bar. The imbibables include seven house cocktails (I was told they’d rotate seasonally), with my recent favorite being the Mexican Grand Prix ($10). It brings together two south-of-the-border hits, Nuestra Soledad mezcal and reposado tequila, with fresh grapefruit and a dried kaffir lime rim, resulting in tangy and smoky goodness. You’ll also discover a solid selection of beer in bottles and on tap, plus local Number Six hard cider and a tight but well-curated wine selection. The spirits and liqueurs standing out on white shelves against a brick wall behind the bar include a fair number of locals, highlighted by all three of the core Westland single malt American whiskeys. The food from chef and co-owner Thomas Dodd (former sous chef at Marjorie) focuses on communal eating, with sides and slightly larger plates designed for sharing. The sliders, boasting house-made chorizo, a lime yogurt and curtido relish (three for $10.50), are already garnering raves, and the creamy burrata with local heirloom toms, basil and a 20-year-old balsamic ($12) is so good you might not want to share. There’s a special brunch menu (Saturday and Sunday, 10 a.m.–3 p.m.) and a few happy-hour-only items (4–6:30 p.m., 10 p.m.–midnight), such as the crunchy and saltily delightful fried pickle chips ($5). Just up the street from legendary cocktail spot Rob Roy, the bar occupies a space last tenanted by The Mix Martini Lounge. But at one point in the address’s history, it was a showroom for the Heywood-Wakefield furniture company, which ties together past to present nicely. The owners—there are six—also have colorful pasts that inform the bar. In addition to chef Dodd, these folks include Hannes Schindler, Chris Tanaka (brother of Tom Douglas chef Eric Tanaka), husband and wife Ziggy and Alexis Taladay (Alexis comes up with the cocktail list), and Ashley Schindler (who makes the wine picks), covering past stints at El Chupacabra, The Shelter Lounge and Re:public. Their combined experience should serve them—and their customers—well. Marjorie) focuses on communal eating, with sides and slightly larger plates designed for sharing. The sliders, boasting house-made chorizo, a lime yogurt and curtido relish (three for $10.50), are already garnering raves, and the creamy burrata with local heirloom toms, basil and a 20-year-old balsamic ($12) is so good you might not want to share. There’s a special brunch menu (Saturday and Sunday, 10 a.m.–3 p.m.) and a few happy-hour-only items (4–6:30 p.m., 10 p.m.–midnight), such as the crunchy and saltily delightful fried pickle chips ($5).